We Beat The Competition - Not Our Customers! ARE ATOMIC OUTDOOR MEDIA'S MOBILE BILLBOARDS EFFECTIVE? * They are, according to Lisa Benson, Media Consultant/Cox Communications of Orange County, Calif., "Just wanted to say THANKS for the Bigger Than Life opportunity you made possible for Cox Communications, Orange County. 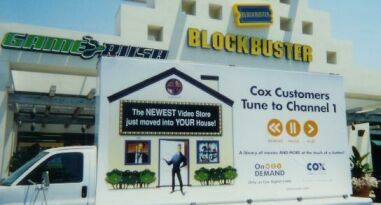 Lately bigger seems to be better and it was definitely the case with our recent moving billboard for On-Demand. After the first weekend our On-Demand movie buys more than tripled. Our internal constituency was also fired up. Thanks for making me look good!" HOW DOES ATOMIC OUTDOOR MEDIA ACCOMPLISH THIS? * We can offer you Moving/Mobile Billboards throughout Los Angeles and Orange Counties as well as Riverside and San Bernardino Counties. You determine the routes. WILL MY POTENTIAL CUSTOMERS SEE MY MESSAGE? * Atomic Moving/Mobile Billboards will be on the streets that your targeted audience will be, be it in cars or walking on the sidewalks. Your eye-catching message will be seen by bored viewers looking for something to read. CAN THEY BEEN SEEN AT NIGHT? AND WHAT ARE THE DIMENSIONS? * Yes, our Moving/Mobile Billboards are illuminated and can be seen at night. Each truck has two billboards which are 10'H x 20'W.